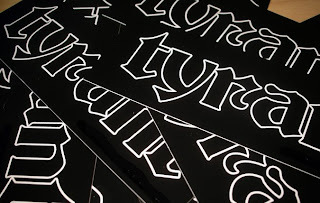 Hundreds of black vinyl stickers arrived today! Last night's Haven rental was pretty wild and crazy. We had BMXers, fixies, flatland, MTB, a little skateboarding, and some freestyle walking going on. Just like last month, the vibe was really chill...which you never get a regular skatepark session. It was good to see Vic from Circuit BMX and some of his buddies head down from Rhode Island. In addition, some of the Scorchers made an appearance again and appeared to have a good time. Thanks to everybody who showed up! I'm shooting for 9-midnight next month, a 3 hour session. Jason got me his shirt design late last night and it's really rad. Jason incorporated a photo he took a few years ago at the TYRANT Jam with some illustration work creating a flowy piece. 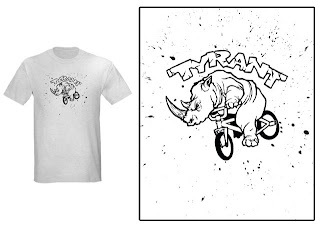 Head over to the TYRANT Store to grab one of these limited edition shirts. 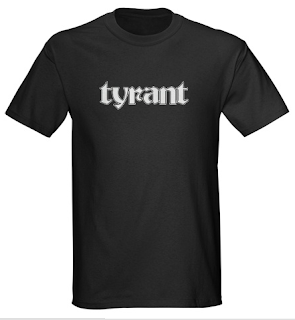 Shawn's shirt is now available for purchase at the TYRANT Store. Get on that! Mr. Hebrank always has amazing ideas and this "Raging Rhino" is pure awesomeness! LAST NIGHT WAS NUTS, in true 80's metal fashion! People were going off, Rob Clancy rocketed over a 41" high bar to take home the bunnyhop title, some lunatic kids slid under a 36" bar to take home the bicycle limbo, and all in all it was a rad night! I printed up a ton of new Ghetto home job stickers and will be chucking out hundreds of them tomorrow at the DropOut BMX 1 Year Anniversary 80's Jam at Haven. 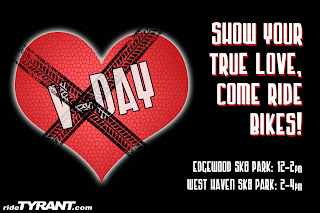 Come to the event, get your 80's metal on, show your love and support for a rad BMX shop, and grab some free TYRANT swag! 6pm till midnight, be there! After 5 years of madness and mayhem the "Whipple Basement" is no longer. The ramps have been disassembled, but the memories will always remain! Dean was kind enough to offer me the ramps and I'm doing everything in my power to get them rebuilt somewhere where they'll be well used and well loved. Long live the Whipple Basement...I think we all suffered a concussion there! The "K-Mart Rail" in Cromwell was removed last month. 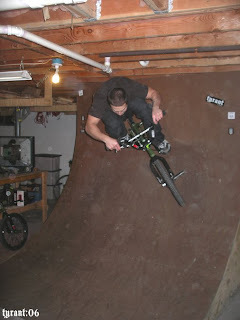 Nobody understood why there was a 2' high rail down a handicap ramp, but we all loved it none the less! 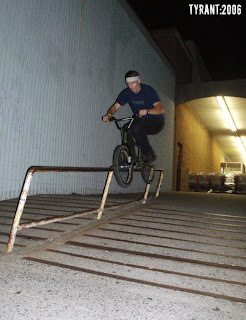 I'm pretty sure the K-Mart rail has been there all my life...and it was the first handrail I ever did on my bike. RIP! So after seeing Tiny TYRANT grinding everything in sight yesterday with his plastic pegs I decided to put mine back on. I bought G-Sport PLEG's last Summer but my MacNeil Titanium Pegs were lighter so I kept running them. The Bristol Skatepark requires riders to have no pegs, plastic pegs, or peg caps and after seeing how many lines, ledges, and rails that park has I needed to conform and go with the plastics. So psyched to ride that park next weekend! Hope the rest of the snow melts away! We showed our love and rode all day! We rode Edgewood in New Haven, the West Haven Park, and then headed back North to ride the new Bristol Park. Brandon and Bryan were going off, they're both getting better each time we ride! So rad! Tons of photos, CLICK HERE! 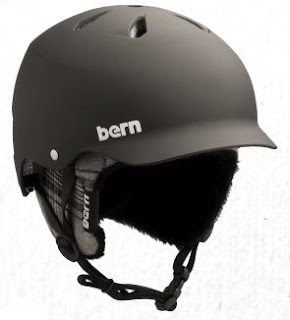 My birthday is the 20th and I got an early gift today, the Bern Watts 8-Track equipped helmet. This helmet is a rad baseball cap style and this model has a winter liner equipped with built-in headphones. So dope! This is my new lid for skiing, riding, extreme sledding, etc. HA! I typically don't listen to music while I ride but this helmet retails for $100 and was on sale for the same price as the non-audio equipped one. No brainer dude, get the nicer model!!! The goggle strap is removable and the helmet also comes with a Spring/Summer liner to keep your dome cool. NIIIIICE! UPDATE: Damn, all along I thought I got the Baker helmet and its really the Watts. The Baker has no vents, the Watts has top and rear vents to let out the heat! 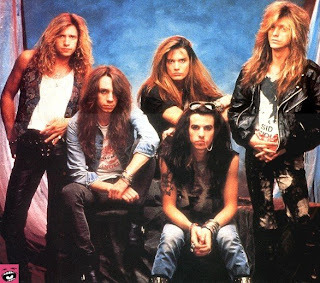 So hott! 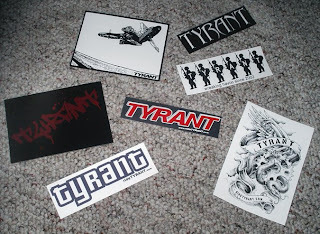 I haven't had stickers made in a while so I just placed an order for some new ones. 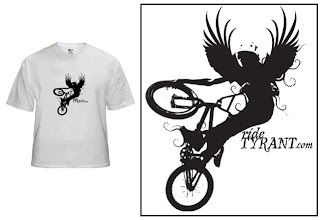 I reverted back to the original TYRANT logo and kept it ultra simple and murdered out, all black! Part of the cheap price is 123Sticker.com putting their "www.123stickers.com" in the lower right hand corner of the sticker which I will be covering in Sharpie! Oh well! I should have these stickers in a few weeks. T and I were visiting family in Rhode Island today and made a point to stop by Circuit BMX to say hello to Vic and grab some goodies. 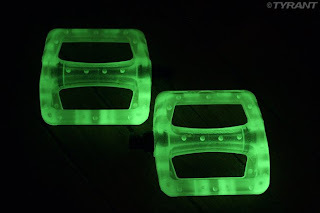 I scored some rad glow in the dark Twisted Pedals and T and I both got Circuit hoodies to rock back over the state line in CT. Support your local small business man, support your local bike shop! 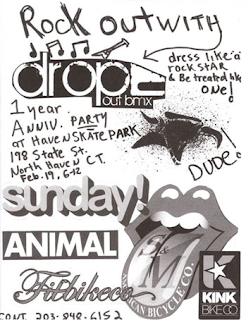 The next time you have a day off or are in Rhode Island be sure to take a spin by Circuit and show some love! That shop is stocked with ALL the latest and greatest stuff!!! Thanks Vic, the shop looks great!